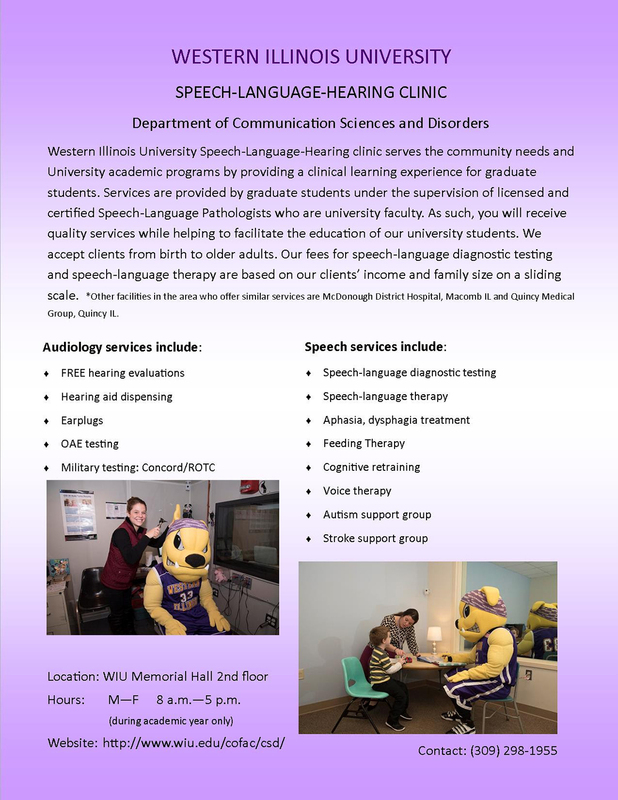 MACOMB, IL -- Western Illinois University's Department of Communication Sciences and Disorders hosts a Speech-Language-Hearing Clinic to serve the University and the community during the academic year. Audiology services provided will include free hearing evaluations, hearing aid dispensing, earplugs and OAE and military testing. Speech services include speech-language diagnostic testing, speech-language therapy, aphasia, dysphagia treatment, feeding therapy, cognitive retention, voice therapy and Autism and stroke support groups. Services are provided by WIU graduate students and under the supervision of licensed Speech-Language pathologists who are University faculty. This clinic is open to the public. Fees for services will be determined by the household income and family size. The clinics will be held from 8 a.m.-5 p.m. Monday-Friday on the second floor of Memorial Hall during the academic year. For more information, call (309) 298-1955 or visit wiu.edu/cofac/csd/.